Your equipment -- whether it's a skid steer loader, an excavator, a compact track loader, or a bulldozer -- won't run without your final drive. When the final drive stops, so does your equipment. When your equipment stops, so does the job. The money you save through final drive maintenance isn't just the expense of repairs, but money you lose when your equipment is out of business! You may hate to take the time to perform maintenance on your final drives, but you can believe us when we tell you that maintenance can save you hundreds (and maybe even thousands) of dollars in the long run. If your equipment has a filter on it, that filter is eventually going to need to be changed. Look in your manual or check the manufacturer's website to find out how often you need to change those filters and what kind of parts you'll need. And don't invest in cheap, off-brand filters -- they can do more damage than not changing the filters at all. One kind of filter that we at Texas Final Drive talk about a lot is the case drain filter. 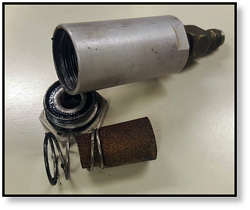 There is a reason we dwell on the case drain filter so much: many of the totaled final drives we receive were destroyed as a result of a clogged case drain filter. This small filter performs the important job of trapping metal shavings and similar debris that naturally gets generated in the final drive motor. The case drain filter keeps this debris from contaminating the rest of the hydraulic system. Once it clogs up though, pressure will build up and quickly total the final drive. Changing out the case drain filter can literally save you the cost of a new final drive. 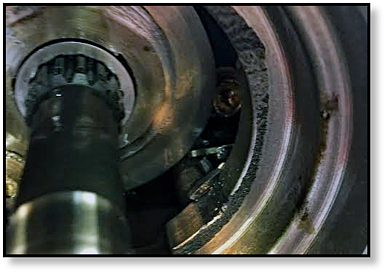 Don't skip this maintenance step, or your may end up with problems like the one shown below -- where the piston shoes were blown out of the rotator group by high pressure hydraulic fluid. 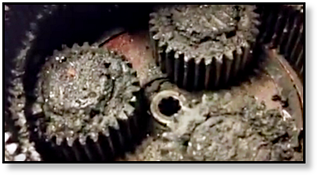 Here's another key piece of maintenance that your final drive needs: check and change the gear oil! If you don't, the result is what Travis (who was our head rebuilder before he joined the sales team) calls "pudding": a mess of contaminants and degraded lubricant that is going to seriously, and maybe even irreparably, damage your final drive or hydraulic motor. Don't be guilty of "making pudding" in your final drive (like the example shown) and destroying it just because you didn't want to stop to change the gear oil. Final drive motor gear oil should be changed out at least once a year, and the levels should be checked after every 100 working hours. If you want to save money, keep your equipment running, and extend the life of your equipment and parts as long as possible, then perform regular preventative maintenance. When it comes to final drives, we emphasize checking and changing the case drain filters and changing out the gear oil. Get in the habit of preventative maintenance -- we promise you that you will be glad you did.